Bentley is [thumb and forefinger just a few atoms apart] this close to signing off a two-seat super-coupe for production. 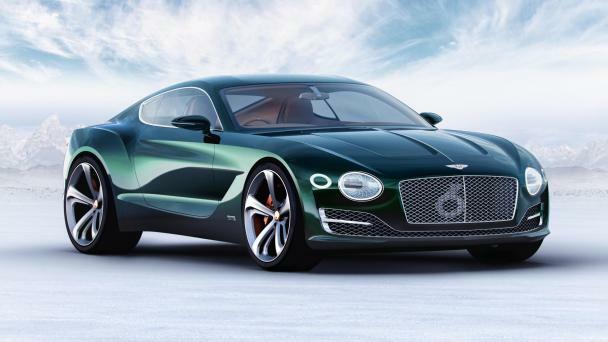 “It ticks all our boxes,” says Bentley’s board member for sales and marketing, Kevin Rose. Aren’t there a scary number of rivals these days? “It actually helps if it has competition like the AMG GT and Aston Martin. It means people have already made a decision to be in that coupe market.” Things like the Jaguar F-Type R (and the upcoming SVR) probably constitute the ‘feeder group’. Rose confirms to us that the Continental GT and the Flying Spur saloon will be replaced. So the EXP 10 – or whatever the production version is called – will need something special to differentiate it. That something will be performance and sporty character. Rose says it will use a version of a new VW Group platform matrix called MSB. This is rear-drive or 4WD, with a longitudinal engine. It was first designed for the next-gen Porsche Panamera. Because it’s modular (like MQB) several sizes of car can come from it. Says Rose: “The EXP 10 will take the MSB platform from Porsche. We will pay them for it but also we have a big hand in the development of that platform. The MSB will be the core platform for the GT, the Spur and the EXP 10, too. It can be different in the front and the rear and the middle. “So you can create a sedan with sedan feel or a sports car with a sports-car feel. There’s lots of flexibility in the height, too.” So it’s possible to make slinky low cars including the EXP10 and Panamera, and higher ones including the next Spur. It seems the design won’t change much for production. It has both sharper lines and more flowing surfaces than Bentley’s current rather formal cars. But it also says things about Bentley’s future in general. Says Rose, “I’d point at the EXP 10. That’s an idea for a specific car, but it’s also a glimpse of our design in general. It’s exactly because it is not radical that it’s a Bentley. It would be dangerous for us to do radical stuff. You have to be respectful of where you have been. AMX stood for 'American Motors Experimental.' The AMX was created to attract young buyers who were buying high-performance models from other automakers.